Anthony Wagg from Burntwood has taken the time to write to me and his mail says it all. 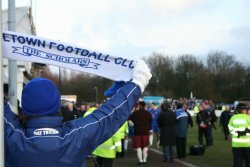 "As a Chasetown fan may I pass on to the players, management & fans of CCFC my congratulations for the assistance given, behaviour towards, & sportsmanship shown to our club on 5/1/08. You were a credit to football, & your division. Please pass on the above via your column. You made a historic occassion for Chasetown a very special day that will live in "Scholars" fans'' memories for years. Good Luck for the cup, & the Championship." Thank you Anthony, we of course wish Chasetown all the very best in their efforts to progress through the league system and we hope that the friendship between the clubs is something that can be used again in the future. As a Cardiff supporter at Church St on Saturday I'd like to thank you for your hospitality.